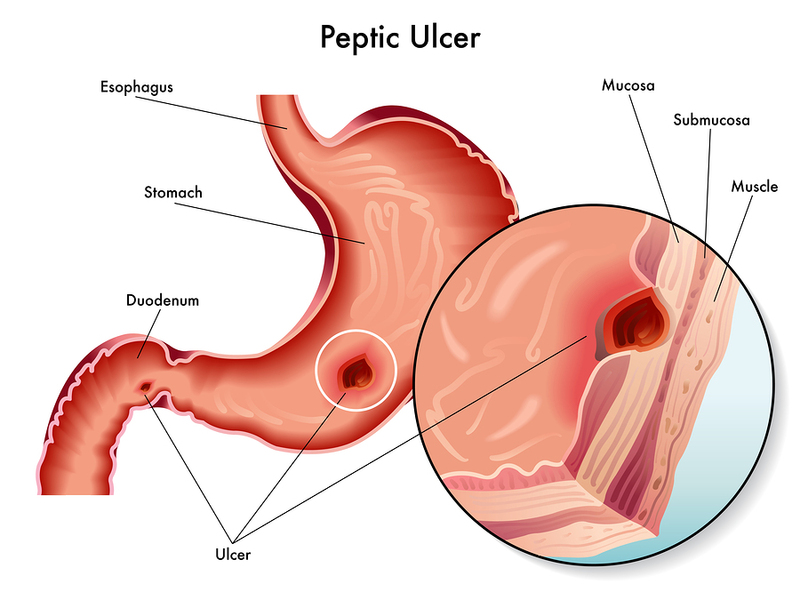 Although people talk about “stomach ulcers”, most peptic ulcers are actually duodenal ulcers. Ulcers usually occur in the first part of the duodenum. When food leaves the stomach it is saturated with hydrochloric acid and it is forced around a C-shape curve of the duodenum. At the beginning of the C-shape wall of the duodenum is where most duodenal ulcers develop. Peptic ulcers can develop when the normal defense mechanisms of the mucosa are non-functioning. This can be from the chronic use of anti-inflammatory medication for arthritis (NSAIDs). But a bacterium called H.pylori can also cause this. This bacterium has developed a remarkable ability to survive in the acidy milieu of the stomach and duodenum. It produces several enzymes, which enable it to neutralize the acid in its immediate micro surrounding. It also produces mucolytic enzymes. These are capable of breaking down the superficial layer of the gastric and duodenal wall. Consequently the acid can now do the rest and erode the wall of the mucosa. 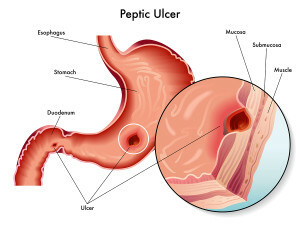 A peptic ulcer (or simply ulcer) is a defect of the mucosal layer. The term “peptic ulcer” comes from a time when physicians had a different thought concept of what ulcers were. They thought that ulcers would develop from a combination of acid and the enzyme pepsin. This, they thought in combination was leading to the ulceration of the esophagus, stomach wall or duodenal wall. As pointed out above, we now know that defense mechanisms also play a tremendous role. In addition, a high secretion of ACTH and cortisol in the case of stress ulcers is also an important factor. This leads to a further weakening of these defense mechanisms. NSAIDs lead to a weakening of the repair mechanisms in the mucosal wall. They increase the acidity on a cellular level, which means that the medication is “ulcerogenic”(can cause ulcers). Ulcers come in different forms. With NSAIDs it is often a multitude of erosions. Gastroduodenoscopy can make them visible. They often occur in the stomach, are very shallow and measure a few mm in diameter. Then there is a chronic duodenal ulcer, which may measure from 0.5 to 2 cm in diameter, and where the bacterium H. pylori may play a role as a chronic propagator. It is clear that any defect of the mucosa, which is full of blood vessels, can lead to bleeding ulcers. There is a wide variety of symptom presentation with ulcers. It can be that a person only has a mild stomach ache in the mid upper abdomen (called the “epigastric area”). To some it feels like a hunger pain, to others like a burning or gnawing pain. This pain might disappear with food or milk, only to awaken the person in the middle of the night again. It can go on like this for several weeks. 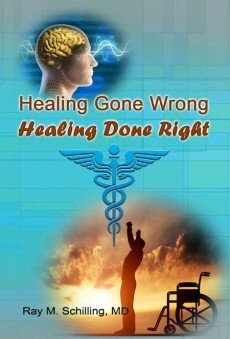 Usually by that time the person sees a physician and complaints that there is something wrong. Only about 50% of patients present with these typical complaints, the other ones have atypical symptoms. With a gastric ulcer the symptoms are such that eating something does not relieve the pain, but aggravates it. 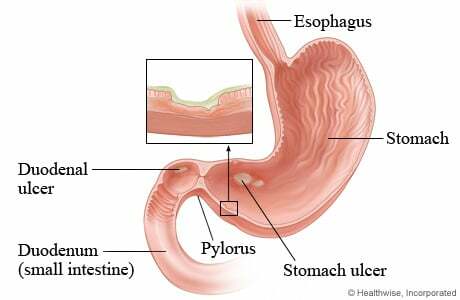 Often the ulcer is at the outlet of the stomach (the pyloric area). The swelling in the area can obstruct the outflow of food and the symptoms are nausea, bloating and vomiting. A duodenal ulcer is causing a more prominent abdominal pain and tends to be more chronic. It happens first in the mid morning, but gets better with food. Only 2 or 3 hours after food intake the pain is back. It may get better with antacids, but this is short lasting. The typical awakening with pain in the middle of the night as mentioned above, is characteristic for duodenal ulcer. Multiple gastric erosions or a deep duodenal or gastric ulcer can get a blood vessel eroded. Subsequently this can cause profuse bleeding with the patient throwing up coffee ground type clotted blood (bleeding ulcer). Melena type black stools from digested blood may also cause diarrhea. Nowadays it is less common that an ulcer perforates. But if it does, there will be acute abdominal symptoms. Part of these can be a rigid abdomen as well as possible symptoms of shock. These last scenarios are life threatening situations. This type of patient needs quick attention in a hospital setting with the help of a surgeon. 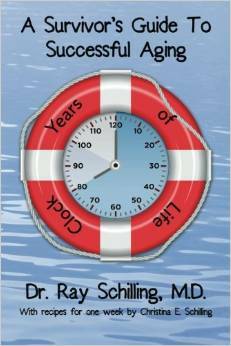 The history gives the physician a good indication of what diagnosis to expect. However, this working diagnosis needs verification. The physician may order a barium swallow, which may or may not show the ulcer. The most efficient way to diagnose an ulcer is by an endoscopic procedure (thanks to www.myvmc.com for this image) called by many names: Gastroscopy (looking into the stomach), gastroduodenoscopy (= looking into stomach and duodenum), panendoscopy ( “pan-” means “all” to express that the physician is looking at all of the upper gastrointestinal tract including the esophagus, stomach and duodenum). Diagnosis by endoscopy is now the method of choice to diagnose ulcers. The reason for this is that with endoscopy the gastroenterologist can do more than just look. This method is superior to X-ray images, because the specialist can take samples through channels in the fiberoptic instrument. The physician cauterizes bleeders under direct vision. Multiple biopsies can be taken during the same procedure for an ulcer looking suspicious of cancer. Minor surgery can be done like removal of polyps or banding or sclerosing esophageal veins that bleed. The endoscopist can also take pictures of the findings. This serves as a useful teaching tool to give to the patient. It is also useful for the physician to document a certain finding as a baseline for future comparison. Like with any procedure there is a complication rate, in this case about 0.2 % of all procedures. The mortality rate is 0.03 %. In the elderly patient friable tissue may be a cause for complications. In an end stage liver cirrhosis patient there can be a rupture of some dilated esophageal varices. This is prone to happen when the endoscopic instrument passes into the stomach. This can cause profuse bleeding, which is extremely difficult to control. To test for the possibility of H.pylori infection of the mucosa, two reliable tests are available. The one test is the rapid urease test, which can test samples taken by endoscopy with a special indicator paper. The other test is the urea breath test utilizing carbon-13 or carbon-14 labeled urea. This is administered as a capsule by mouth and breath samples are taken 20 to 30 minutes after ingestion, which determines how much of the urea was digested by H.pylori, as the amount of liberated labeled carbon dioxide is proportional to this process. Sensitivity and specificity of this sophisticated test is more than 90%, which means that it is remarkably reliable. The treatment is tailored according to the underlying problem. If there are recurrent peptic ulcers in the lower esophagus, the stomach or the duodenum, then there is a high probability that H. pylori is present and appropriate testing should be made. In the case of a positive test, the patient should receive a triple therapy regimen, which consists of a proton pump inhibitor combined with two antibiotics (see Ref. 1 for one such regimen). The one year relapse rate used to be more than 60% for gastric and duodenal ulcer patients after cessation of traditional anti ulcer therapy. After triple therapy for H. pylori the recurrence rate is less than 10% after one year, clearly supportive of the idea that H. pylori plays a role in the more chronic ulcer cases. Most of the ulcers, however, are not due to H. pylori. They may simply be due to the fact that the balance of ulcerogenic factors versus body defense mechanisms was tilted in the ulcerogenic direction. Reduction of alcohol intake, quitting to smoke (or at least cutting down to a minimum) and adding an H2-blocker will often help restore the balance within a few days. Another useful agent in this scenario are the cytoprotective drugs. One such medication, which has been around for some time, is sucralfate (brand names: Sulcrate, Carafate) which binds to the surface of the mucous membrane and protects against noxious substances(see Ref. 2). Another such cytoprotective medication is misoprostol (brand name: Cytotec). The H2-blockers are now widely available over the counter in pharmacies. Some common H2-blockers are: the first one to be developed was cimetidine (brand name: Apo-, Gen-, Nu-,Novo-, Nu- and PMS-Cimetidine, Peptol, Tagamet). Then ranitidine (Zantac, Alti-, Apo-, Gen-Ranitidine, Novo-Ranidine, Nu-Ranit) came on the market. Since then famotidine (brand name: Pepcid, Ulcidine, Maalox H2 Acid Controller and generic preparations) has been added as well as nizatidine (brand name: Axid, Apo-Nizatidine). No doubt, there will be more added in this lucrative market. However, the problem is not that one of these H2- blockers would be better than another, the challenge is to find out why the patient does not respond to one or two courses of therapy. The proton pump inhibitors (PPI) are the strongest anti-acid medications. A well-researched remedy for stomach ulcers is licorice root. Licorice however contains glycyrrhetinic acid, which can elevate blood pressure. So scientists developed deglycyrrhizinated licorice tablets (DGL for short), which is very effective in relieving stomach ulcers, but does not elevate blood pressure. It comes in chewable tablets 380 to 400 mg of DGL per tablet. According to Murray (Ref. 35) the growth of H. pylori, a bacterium that causes difficult to heal ulcers is inhibited by DGL. In head-to-head studies, which are cited by Ref. 35 DGL was more effective than Zantac, Tagamet or antacids. Two to three chewable DGL tablets taken between meals or 20 minutes before meals will heal ulcers within 8 to 16 weeks. The difference is that with DGL the ulcer is healed, while with standard medication described above it is only symptomatically suppressed, but will often flare up when the treatment is stopped. 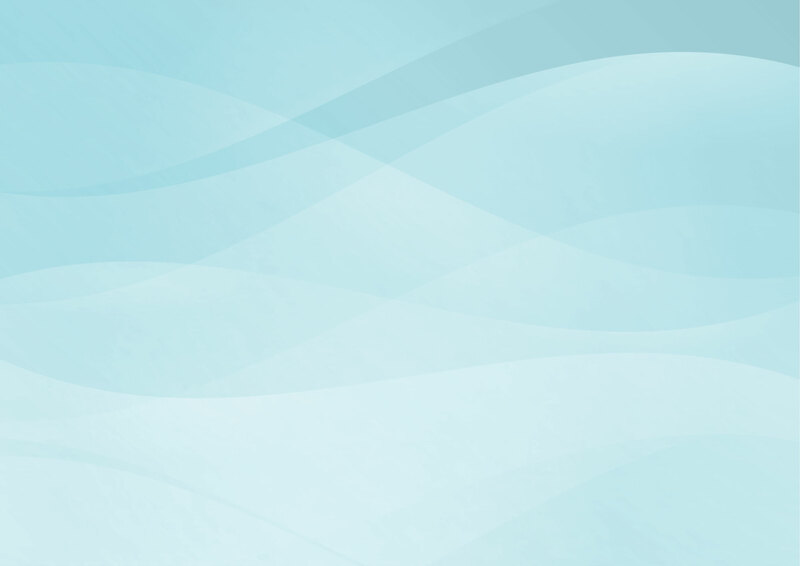 DGL stimulates the normal defense mechanisms of the stomach and duodenum, improves the protective substances that line the intestinal wall and improves blood supply to the intestinal lining. The result is that the lifespan of the intestinal cell is prolonged. Peppermint and caraway seed oil capsules are helpful for patients with GERD (gastroesophageal reflux disease) and IBS (irritable bowel syndrome). 200 mg of this oil mixture three times daily between meals will help with abdominal pain, altered bowel function (constipation or diarrhea) and dyspeptic symptoms (nausea, anorexia and flatulence, see Ref. 35, page 74). It is up to the physician to rethink the “differential diagnosis”. Is it really a peptic ulcer? Or is this patient one of those more chronic cases with H.pylori and perhaps this should be tested again? If not, why is the patient still having symptoms? There could be an underlying Zollinger-Ellison syndrome, a rare condition where benign tumors in the pancreas produce gastrin, which in turn is a powerful stimulus for acid production in the stomach. In rare cases of very chronic H. pylori infection, a gastric lymphoma (MALT lymphoma) can develop in the gastric erosions or ulcers. The gastroenterologist will have to carefully follow this condition with serial endoscopies and biopsies while the patient is being treated with combination therapy. Some of these cases get cured with anti H. pylori therapy. Other cases of MALT lymphomas progress despite therapy. They have to be referred to an oncologist for chemotherapy or radical surgery. Gastric outlet problems that have developed from chronically scarred ulcers in the pylorus area (gastric outlet), need attention. A general surgeon with experience in stomach surgery should be consulted. Some surgical procedures, called Billroth I and II, were originally developed for intractable ulcers when H2-blockers were not yet available. Sometimes a patient needs one of these procedures done or else a selective vagotomy. The gastroenterologist and surgeon can advise you further. Life style changes are still important. However, they are not as crucial as they were in the past before H2-blockers and the proton pump inhibitors were introduced. 35. 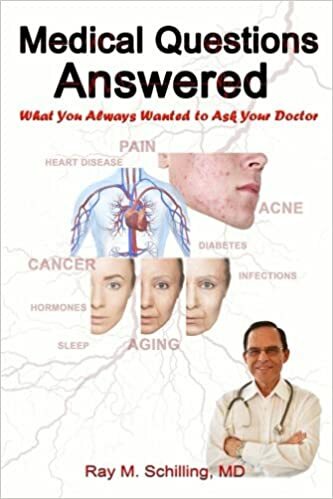 Michael T. Murray, N.D.: “What the drug companies won’t tell you and your doctor doesn’t know” – The alternative treatments that may change your life – and the prescriptions that could harm you. Atria Books (subsidiary of Simon & Schuster Inc.), 2009 (page 73).